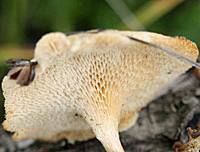 Polyporus brumalis is a winter polypore that grows on fallen branches of deciduous trees. 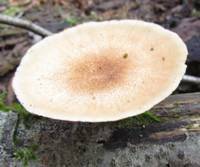 The pores of these thin-capped polypores cannot be detached from the upper layer of the cap. Tough and inedible, these are not fungi to gather as food; however, the dried caps are sometimes used as table decorations or as inert contributors to pot pouri. Because it is such a late species, this fascinating fungus is commonly called the Winter Polypore. 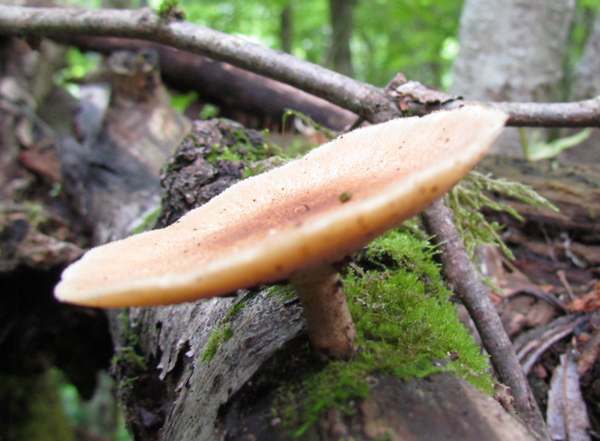 Polyporus brumalis is fairly common and widespread across most of Britain and Ireland. It occurs also throughout mainland Europe and in many parts of Asia and North America. Well camouflaged among the fallen leaves, these brown funnel-shaped caps can be difficult to spot, but when you do come across one there is often a small group on the same fallen log. The Winter Polypore was described scientifically in 1794 by Christiaan Hendrik Persoon, who created its basionym when he gave it the scientific binomial name Boletus brumalis. 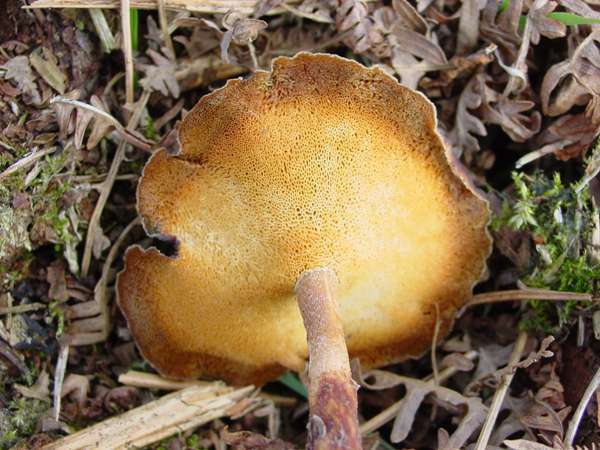 in 1821 the Swedish mycologist Elias Magnus Fries transferred this species to its current genus, at which point its currently-accepted scientific name Polyporus brumalis was established. Synonyms of Polyporus brumalis include Boletus fuscidulus Schrad., Boletus brumalis Pers., and Polyporus fuscidulus Schrad.) Fr. The specific epithet brumalis means 'of winter' and is another reference to the emergence of this species mainly in the cooler months of the year. The fruitbodies of this tough little polypore are very slow to rot (and bugs must find many other fungi much easier to chew!). As a result you can expect to find Winter Polypores all through summer, albeit with darkened pore surfaces (see left) and no longer producing spores. The upper surface of the cap of this occasional polypore is smooth and usually grey-brown but very variable in colour and often zonate. As they age, the fruitbodies become much darker. 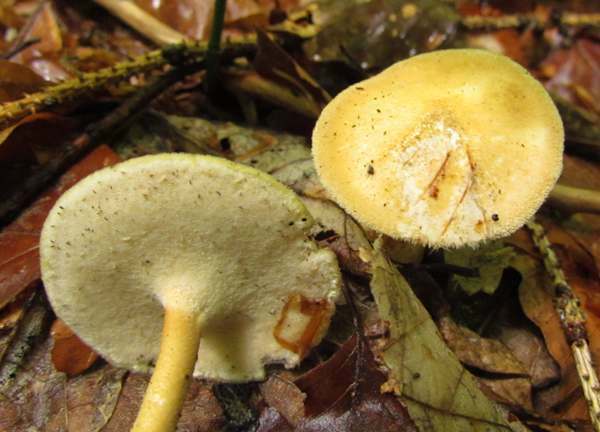 2 to 8cm in diameter and with cap flesh 1 to 5mm thick, the fruiting bodies usually have inrolled and often somewhat wavy margins. The flesh is white and leathery, becoming very hard in dry weather. Beneath the cap, the white tubes are packed together at a density of 2-3 per mm; they are between 0.1 and 0.4mm deep and terminate in whitish pores that turn buff as they age. Cylindrical or sausage-shaped, smooth, 4-7 x 2-2.5µm; inamyloid. Saprobic, restricted to dead hardwood - usually fallen branches and particularly Beech. Late autumn through to the end of spring. Polyporus ciliatus is very similar but has much smaller, more densely packed pores. This polypore fungus is too tough and insubstantial to be of any culinary interest.